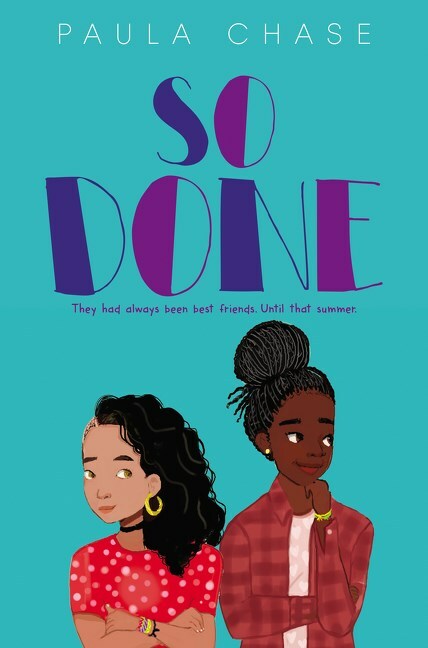 Told with a combination of texting and prose and in an African-American Vernacular English, So Done by Paula Chase is a novel about friendship and growing up in the ‘tween years. Having been a squad since fifth grade, Mo, Sheeda, Tai, and Mila are thirteen and kicking back during the summer before they enter eighth grade at Woodbury Middle School in Del Rio Bay. Their neighborhood is called Pirates Cove, one of four low-income projects and “home to more than seven hundred people, some Latino but most Black, all of them poor by Del Rio Bay standards” (29). In the Cove, it was boss or be bossed, so MeTai Johnson (Tai) is uppity and bossy. She’s also stubborn and, in her own words, “bootyicious curvy.” Tai’s best friend, Jamila Phillips (Mila) who lives across the street has a lean ballerina body. The two girls are in dance together, and the buzz of the neighborhood is all about TAG, a new talented and gifted after school program for their age group. After having been in the Woods for the summer staying with her aunt, Mila returns cautious and changed. She hates drama, petty gossiping, constant instigating, and fighting, but she has a passion for dance and her family. As Tai wonders about and navigates her friend’s altered behavior, she reflects on her own life in the hood and focuses on her love interest, Rollie. Amidst this swirl of change and the stress of the TAG auditions, the squad learns that everybody has a job to do in a friendship. Tagged AAVE, friendship. Bookmark the permalink.